With uncommon flair and humanity, photojournalist Mosa’ab Elshamy has borne witness to Egypt’s political upheaval since the first days of the uprising that toppled President Hosni Mubarak in 2011. Though he is only 23, his talent for capturing intimate images of individual Egyptians in the midst of turmoil has attracted a sizable online following and increasing recognition from the international press. After the August 14 killings his photos appeared on the front pages of The New York Times, the Guardian, the Financial Times and the Daily Telegraph. And he recently had two big spreads in TIME. On August 14, when the new military-backed government sent security forces to disperse supporters of deposed President Mohamed Morsi from two protest camps, Elshamy documented what would become Egypt’s worst incident of mass killing in decades. The same day, his brother, Abdullah, an Al Jazeera reporter was arrested while reporting from Cairo’s Rabaa Al-Adawawiya Square. He has now been detained without trial for over a month. On Monday I sat down with ElShamy to ask him about photojournalism, the revolution, and how his family, split between Islamists and non-Islamists, has weathered this most recent chapter of personal and political crisis. 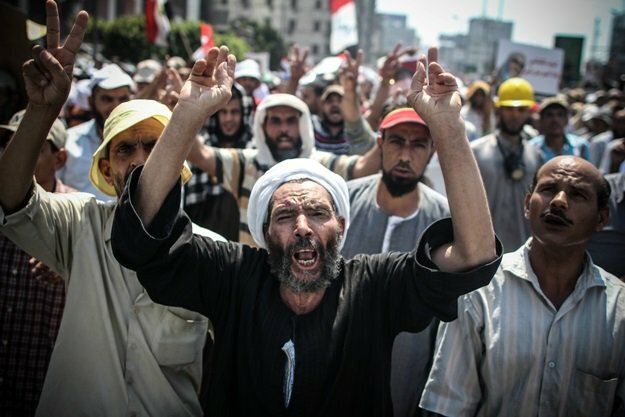 Supporters of ousted president Mohammed Morsi march in Cairo calling for his return on August 2. Jared Malsin: You grew up outside Egypt, in Nigeria. Can you tell me more about that? Mosa’ab Elshamy: My dad works in an NGO and he has been travelling since the ‘80s. It was mostly in Africa. His work dealt with refugees most of the time. His work started in Yemen where, actually, I was born, and then he went back to Africa, to Sudan, Ethiopia, Senegal, to Chad, different countries, but it was in Nigeria that I grew up, and I had most of my education there. It’s also the reason my older brother, Abdullah, took an interest in Nigeria and Africa in general, and that is where he later worked and got his Al Jazeera job. JM: When did you move back to Egypt? ME: I came back here for college, in 2005. JM: You started doing photojournalism during the 2011 revolution, is that right? ME: Yes, I had already been doing photography a couple of years before that, since 2003, but it was very amateur photography. Six months before the revolution, with the Khaled Said incident (the police killing of an unarmed man in Alexandria) and the protests, I started to explore that venue. It was mostly during the revolution and, very precisely, after the revolution that I actually started doing photojournalism intensely because my camera was broken during the revolution. I was injured. JM: What was the moment when you decided this was the thing you wanted to do? ME: Late 2011, when I was shooting the clashes around Tahrir, Mohamed Mahmoud, then the Cabinet clashes, and then I found something not just appealing but something I really enjoy doing. For the nine months before that I had grown enough in my skills and learned enough. So by that time I produced good work. And at the same time, the clashes and the aftermath made me find something that wasn’t there earlier. ME: In a sense, it was during these moments of chaos that I found out what really intrigues me, which is the very individual stories and the very intimate moments in a bigger scene of chaos, and a bigger image. Most people pay attention to the collective mass. I think it was in these moments that people really stand out individually and also in the aftermath, whether it’s in morgues, whether it’s in funerals, or the aftermath of any violent incident. JM: Can you give me an example of one of those moments? ME: In 2012, it’s one of my favorite moments from the revolution and one of my favorite pictures as well, when there were clashes after the Port Said massacre. The clashes had been ongoing for three nonstop days and there was all the teargas and rocks and fire, but there was this moment when the front protesters threw fireworks at the police. They actually threw the fireworks horizontally, so they were wrapped in this moment when the police and protesters and the Ministry of Interior and Mohamed Mahmoud [Street]. It was all covered in a very beautiful-looking but absolutely chaotic firework, with different rays. 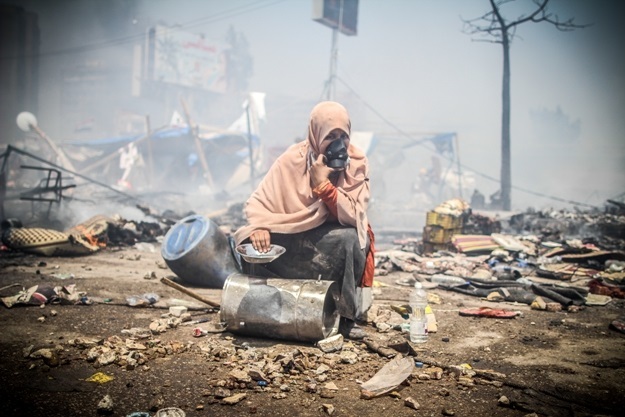 Also in the recent incidents, photos in the aftermath of violence, for example there was a man sitting late during the Rabaa day (August 14), observing the camp completely on fire. This is what moved me. It was impossible to tell what was going on in his mind but it seemed like he was overlooking complete chaos and destruction, and just waiting for this end, or defeat. JM: Can I ask about your brother Abdullah? What’s his status right now? ME: Abdullah works for Al Jazeera, and he’s usually based in Abuja. He came to Cairo on the second of July and he was stationed in Rabaa. He was reporting from there for Al Jazeera on a daily basis. On the 14th he was among the very last group who were there when the security forces had completely broken in. Those were the ones who couldn’t make it. He was arrested. Obviously they didn’t care much about him being a reporter and a journalist, so he was later sent to Abu Zaabal [Prison] the next day. He was sent on a day when 38 people were killed in a transport van. It was very scary; this question, “Was it him?” It was a very long couple of hours before we knew [he was safe]. Recently his detention was renewed for 15 days and we got to see him twice in the past month. The visits are very brief and we’re happy to know that he’s doing well physically and morally and he’s holding up. A female protester bangs metal to make noise during attacks by security forces on Rabaa Adaweya camp on August 14th. JM: What was it like visiting him in prison? ME: It was quite difficult. I was imprisoned a year ago, and I think it was, psychologically speaking, it was more difficult to visit than be visited in prison, and there was all the bureaucracy and what I would call ‘intentional complication’ put up by the administration of Abu Zaabal Prison for visitors of Rabaa, where you had to undergo a very long process. It took us up to six hours just to get to see him very, very briefly, with no physical contact, and try to deliver him some bags and books and stuff. But obviously, these very few minutes, you cherish them. It was good just to know he was doing well, but it wasn’t a very fond memory to have. ME: Yeah, they’re not complying. The latest we became aware of is that there are no individual sessions where people present their cases and get to defend themselves or plead guilty, because the number there is quite huge and it must be overwhelming for the prosecution to have this process with over 700 people. The entire group has been treated collectively. JM: You were visiting him in a large room with other people? ME: It wasn’t exactly a room. It was part of the prison yard. It was fenced. They would get five prisoners from one side and call five families that would see them through this fence, see them next to other people, with lots of officers looking over their shoulders, and they would just whistle and that’s the end. They would take the prisoners away. They would bring another batch of prisoners for other families. JM: Were you close with your brother? ME: Yes, because the age difference between me and Abdallah is just two years. We have a lot in common, and the last days before he was arrested he was always in the Rabaa media office, and I also stayed there for a long time. So even though he’s in Nigeria for most of the year, ironically enough, it was in Rabaa that we got to spend more time together than usual because I was there on a daily basis taking photos, and he was stationed there. JM: So you would visit him in Rabaa? You’d hang out? ME: We would usually go around. He would film, and I would take photos. It was during Ramadan so we would have breakfast together. He also helped me quite a lot because Al Jazeera was favorable in Rabaa, so being an Al Jazeera reporter gave him a lot of access. So on both a personal and a professional level it was very good. JM: Did you learn anything about your brother during that time that you didn’t know before? ME: I’ve always known he was very courageous because he did report from Libya, specifically Misrata, during the revolution, and from Mali, but it felt sometimes like he was chasing these wars. But to see him engage with the protesters there on a very human level and try to get their stories, try to look beyond the line that was being broadly presented, that they were ‘Muslim terrorists’ or armed people, and just try to humanize these people, whether they were right or wrong—it made me respect his work a lot more. I did have some reservations about Al Jazeera’s rhetoric. I made it clear to him, and he actually took that well. And not just for me, the entire family did. The way to see Abdullah was to go to Rabaa, and we actually did spend the Eid [holiday at the end of Ramadan] at Rabaa because he couldn't leave. JM: So, your mother and father weren’t necessarily happy about that? ME: My family is kind of split between Islamist and non-Islamist roots, so we always have these discussions, but we were all very happy to just brush politics aside and just be at a place convenient for everyone. 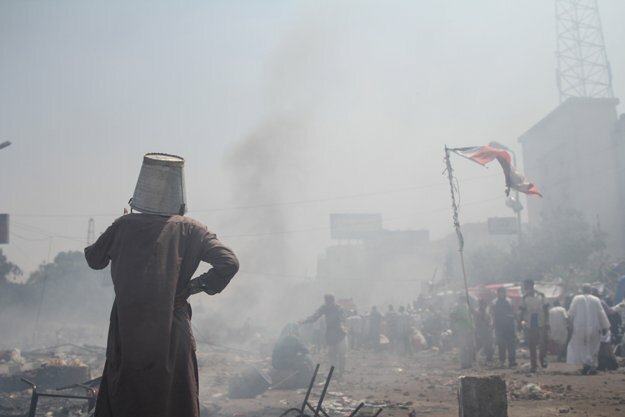 A pro-Morsi protester watches during the violent dispersal of Rabaa Adaweya camp by security forces on August 14th. JM: Even your non-Islamist relatives came down to celebrate Eid in Rabaa? ME: Yes, at least my mom. JM: So your dad leans the other way? ME: Yes. It was funny. We all actually joked about it. It’s these incidents that at the end of the day make me cherish my family and my brothers despite our different politics, from far right to far left. Perhaps if people were able to apply these little standards on a greater scale, the country wouldn’t be in such a mess. JM: How do you differ from your brothers, politically? ME: My oldest brother is a Brotherhood member, so in that sense we do differ a lot because I definitely lean more toward the revolutionary camp than the Islamists. So we’ve had our fair share of arguments in the past two years, loud and intense ones at different points in the revolution, and it only got worse as the polarization in society became more extreme after the Brotherhood came to power. Thankfully, we haven’t let it get too personal and cut deep. It’s becoming normal for people to lose friends. Families get torn apart by such things. Abdullah was more of a centrist figure in that sense. He tried to pull these two sides together and let them sit and talk. He didn’t lean fully toward the Brotherhood; he isn’t a member of the Brotherhood. But he also condemned a lot of what the non-Islamists did. The same applies to my parents. They’ve had their differences. We’ve learned quite a lot from both of them. In that sense we’ve all gotten to be in the shoes of the other. Because when it’s your brother you obviously dehumanize them less, or not at all. JM: How many brothers do you have? ME: There are four of us. JM: Are they all working in journalism? ME: Three of us are working in journalism. Me, Abdullah, and the youngest works in Anadolou agency [Turkish news agency]. He’s a photographer as well. The oldest works in new media. JM: Can you tell me more about what happened on August 14, what you were doing on that day, what that experience was like? ME: It was quite an awful experience. I really didn’t believe I would get out of Rabaa alive. I got there at eight in the morning, and I stayed until 4 p.m., and all I saw really was people getting killed. The fire was all over the place. The makeshift hospital itself was another horrific place to be. Rabaa really was like nothing I ever saw before, the level of force being used and the atmosphere, people around you getting killed, with no place to run. The place was surrounded. This was quite terrifying. JM: At one point you tweeted that you were almost shot, that a bullet went right by your ear. ME: Yes. These were the snipers, actually, on the roofs. I was taking photos near Tayaran Street and, I mean, I’m usually very, very cautious and actually very, very afraid. And I was taking as much care as I could. I was crouching next to a tree and taking pictures of people who were trying to save whatever they could from the tents, and all of a sudden I heard this extremely quick buzz pass next to my ear. I hadn’t heard anything like this before. It was definitely a bullet that I very luckily escaped. This was the scary thing about Rabaa, is that your safety had nothing to do with how skilled or how good you were at this thing, just how lucky. They weren’t targeting militants. They weren’t targeting specific people. They were trying to kill as many people as they could, indiscriminately. In that sense, it made the whole day even scarier. JM: You were saying you’re very cautious, but still, it takes courage, it takes bravery to walk into that kind of a situation. ME: I don’t know about this. I’ll be honest with you, I’ve heard people say “You’re very courageous,” that kind of thing, but I remember myself very well, in Rabaa and Ramsis (clashes) and Manasa (deadly shooting incident) in July, and I am very, very terrified. So, maybe in a sense it’s this fear that does drive me forward, rather than courage. JM: The fear drives you forward? ME: When the bullet brushed next to my side, I threw myself on the ground. And it was my cue to leave. I couldn’t stay any longer. That is how afraid I am. I have no problem being honest about this, that I’m really scared of this. I don’t want to keep doing this for a long time, because I don’t think it suits me. But yes, I feel like I was able to do a good job, and I was able to get lucky and stay alive, but I don’t know about courage. JM: I know you’ve been out photographing the anti-coup demonstrations, last Friday for example. Tell me more about that. ME: It feels very weird to be in the middle of a completely ignored and isolated crowd, in a bubble-like world, where people are still taking to the streets, turning out week in, week out, in huge numbers, showing determination and persistence, and persevering for what they stand for, and yet be completely isolated from the media and the people in their homes and that sort of thing. So I think it’s very important to document these kind of protests that I would say are a bit similar to protests we saw at one point in Bahrain, where there were huge demonstrations, but only in specific areas, and they’re completely ignored. In a sense what I’m noticing is that the diversity of the demonstrators is starting to widen a little bit, and with time they’re gaining more momentum rather than losing it, but still, it’s widely ignored. The ones I witnessed were completely peaceful. They also leave after Friday prayers, and they pass through districts where they try to avoid military checkpoints and police. But when it comes to evaluating these protests and seeing if they are going to make an actual change at the moment, or if they are going to turn the tables, I doubt that at least in the near future. JM: You’re saying the diversity is increasing, meaning the number of non-Islamists is growing? ME: Yes. I’ve been taking photos of pro-Morsi marches since his ouster, and it was mostly dominated with white galabiyas (traditional men’s garment) and bearded protesters, ones who were most of the time not even from Cairo. At the moment its still, in a way, Islamist-dominated, but there are signs of non-Islamists, sometimes non-veiled women, lots of non-Islamist looking youth among them. It is gradually changing but I wouldn’t say it’s yet fully representative. JM: Does it make it harder for you to go out and work, with your brother in prison? Does that weigh on you? ME: Abdullah is always present. His absence is quite difficult, but I would say my family is used to this. My dad has been in prison, and me and my brother. So we as a family know how to live with this, and it’s always good to know he’s doing well. I know that if he was here he’d be doing his job and trying to get the truth out, so I also try to do that. JM: When was your father in prison? ME: He was arrested in the 80s, for a couple of months, back when Sadat was assassinated and pretty much every political activist in the country was being rounded up. JM: Are you afraid of being arrested? ME: Everybody is afraid of being arrested at the moment! Even those who are not so opinionated, or who aren’t mounting a fight against the current regime, everybody is prone to be arrested at a checkpoint, or under the state of emergency. With the crackdown on media, journalists, and photographers, there is more of a risk, being around and noticed, taking photos on the street. JM: Do you think that you’ve changed as a person in the last two and a half years since the revolution? ME: I feel like I’ve grown 20 years in the past two years. I would say everyone did change. I definitely did undergo a lot of transformations, very personal ones, and others political, not to mention the professional aspect. I’ve come to reconsider everything I believed in, lots of stances that before the revolution seemed very concrete and solid, but with the craziness—not just in Egypt, but throughout the Middle East—has forced everyone to reconsider, and give this another look, from another perspective.